Even the Soviet authorities allowed the traditional Russian Easter dessert to appear in their national cookbook, despite its religious roots. Kulichi, hot cross buns, matso - it's fun when your family is multinational, multicultural and multi-pastry. 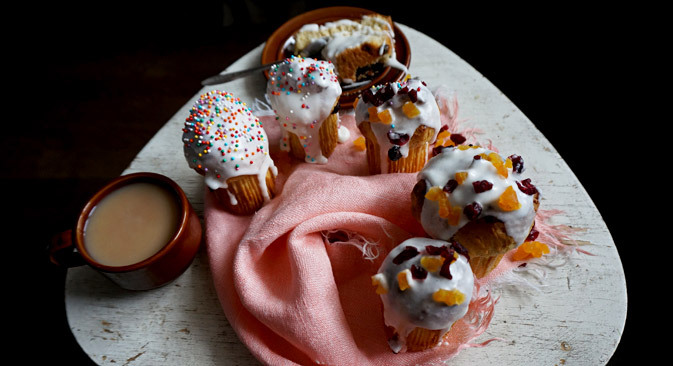 Kulich is the Orthodox Easter cake that, along with paskha – a dairy Easter dessert – and colored boiled eggs, has been around in the first warm days of spring for as long as I can remember. I was surprised and happy when I saw it in the Book – an Orthodox meal in a Soviet cookbook? "In 1943 Stalin felt that the communist ideology wasn't enough to get the people through the war, and he turned to church. He restored the patriarchate, and some churches and synagogues started to function. However, everyone who went was followed - and knew it - so in actual fact the church was still underground. Easter celebrations happened quietly in apartments, but not on a state level like now," reports granny. One of her best friends, who grew up in a village, said that in Easter was widely celebrated even before and during World War II. "Everyone became very kind and giving before Easter - people would collect food for those in need. I loved Easter as a kid: we played lots of games, like rolling eggs downhill and breaking them on each other's foreheads, and men would build giant swings for the young girls. I remember in the 1920s, the new government started destroying churches and throwing bells on the ground - and people were laughing with joy, despite the fact that 'red corners' with icons were there in most houses. There might have been a disconnect in people's minds between the religion and the holidays. There was a priest in our village who wore a vestment and would get stones thrown at him." Looking into the fascinating world that is a Russian village, and boring yet another old lady with my questions, I found out that the most active young people would try to flee from the village and collective farm before the age of 16, which was when they received an internal passport. Granny's aunt had a housemaid from the village, and Aunt Felya taught her to read and write and got her a job at a factory. "I have a very vivid memory, when in 1948 I went to a village and saw a birch tree with the bark taken off to human height. Turned out locals would grind it and add into flour as there wasn't enough. They would also add grass or stinging nettles to it," reminisced Granny's friend Yulia. Today's Easter celebrations are widespread, and I was very pleased with the recipe for kulich - it was just as I remembered it from my childhood, where I, like a village kid, loved the holiday for the cake and the eggs, and the warm weather, but had no idea what it was about. I only wish we had games like rolling eggs downhill and letting the owner of the fastest egg eat all the other ones! Pesakh, Armenian Easter, Catholic Easter, and this Sunday Orthodox Easter - it's sure been a fun week for the extended family. Dough for kulich can be prepared in two ways. The first method. Dissolve yeast in 1 1/2 cups warm milk. Add half the flour. Stir to avoid lumps. Cover and let sit in a warm place. When the volume of the dough has doubled, add salt, egg yolks, sugar, vanilla and butter. Mix together. Beat egg whites to a froth and add the remaining flour. The dough should not be too thick, but should come freely from the sides of the mixing bowl. Cover the dough and put in a warm place. After it doubles again, add the raisins (washed and dried), sliced candied fruit, ​​and diced almonds. Mix with the dough. For a fluffier cake, fill cake pan to 1/3 height; for a more dense cake, to ½ height. When the dough has risen to 3/4 the height of the form, spread the top with beaten egg and put in the oven (not too hot) for 50-60 minutes. During the baking, carefully turn the cake mold, but do not shake. To make sure the top of the cake does not burn, after it gets brown, cover it with a circle of paper moistened with water. The cake is ready when a knife stuck in comes out clean. After cooling, the cake can be covered with glaze and candied fruit, berries, jam, chocolate figures and so on. The second method. Dissolve the yeast in half a glass of warm milk. Add 4 cups of flour and knead the dough, then add salt, sugar mixed with egg yolks, melted butter, and egg whites that have been whipped into a foam. Stir together, sprinkle with flour, cover and put overnight in a place protected from drafts. In the morning add the remaining flour and vanilla, then knead the dough as specified in the first method of preparation. Cover the dough and put in a warm place to rise. Once the dough has risen, add raisins, almonds, etc., Stir and put in shape. Otherwise proceed as described above.